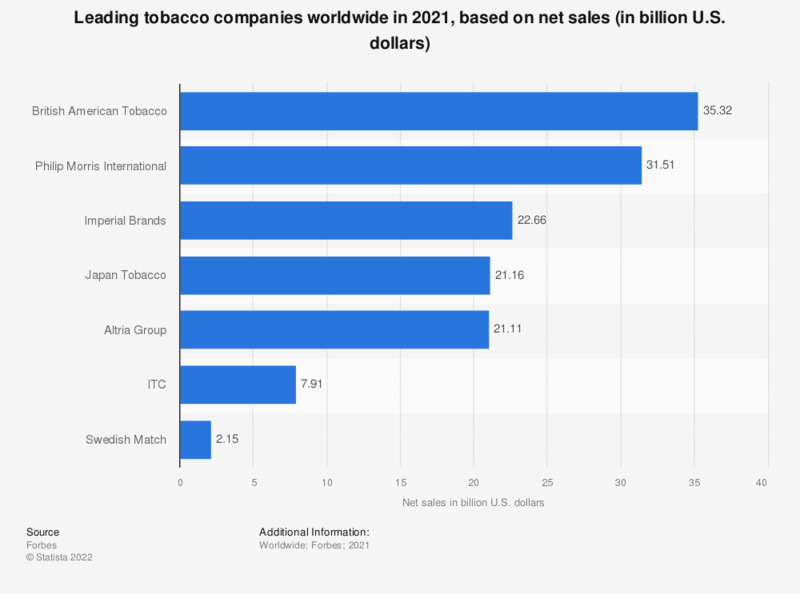 With nearly 30 billion U.S. dollars in sales, Philip Morris International was the leader among tobacco companies around the world in 2018. The company, head-quartered in New York, sells its products in over 180 countries. Its most recognizable brand, launched in 1904, is Marlboro. The company edged out British American Tobacco, makers of Camel, Lucky Strike, and Newport cigarettes, and Imperial Tobacco, makers of Kool, and Winston cigarettes. Despite having the most recognizable American cigarette brand, Philip Morris International does not sell cigarettes in the United States. In 2007, Altria Group (formerly Philip Morris Companies Inc.), spun off its international segments into the independent entity Philip Morris International. Global cigarette consumption, which peaked in 2009, has been on a downward trend since then as more and more consumers are aware of the health risks associated with smoking. Sales of Philip Morris cigarettes have likewise been declining, dipping over 20 percent in the last seven years. In spite of a trend which is troubling for a company that produces tobacco products, revenues of Philip Morris have remained relatively stable over that time period. Ranking is based on sales figures. Further details regarding the methodology can be found here. Everything On "Imperial Brands" in One Document: Edited and Divided into Handy Chapters. Including Detailed References.